Beef tri-tip is an awesome steak, or uh er, it’s almost a roast. It’s a bigger cut of meat and is part of the sirloin (think the “love-handles” of a cow… you’re in the right neighborhood). The steak is triangular in shape and offers great ‘beefy’ flavour however can be a challenging cut to cook to the desired results. 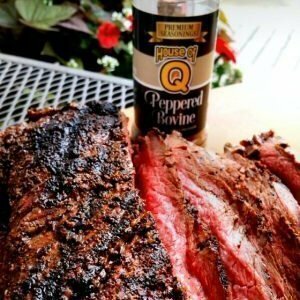 BBQ Brian created a video of the steps he took and wanted to share on how to cook beef tri-tip. Look for the video below. Every cow of course has two tri-tip steaks however many butcher shops don’t have a demand from their customers for it thus it often ends up as ground beef. For those that do request it they know how special it can be when cooked properly. If you are looking to master cooking large or thick-cut steaks, this is the video to watch. The technique BBQ Brian’s uses shows the mastery of attaining great color and an appealing crust on the outside while creating the perfect color, moisture and texture on the inside. The grill BBQ Brian used was his Char-Broil TRU-Infrared three-burner gas grill. The grill has cast iron grill grates and the thermometer in the video is the Char-Broil Wireless Thermometer. Good luck and invite some friends over!